The coming couple of months will be crucial for India’s foreign policy. Prime Minister Manmohan Singh is scheduled to have meetings with US President Barack Obama and Pakistan Prime Minister Nawaz Sharif in the last week of September and is expected to pay a visit to China in October. The three most important templates of Indian foreign policy are sailing into view. The visit to Washington comes as an American initiative. The UPA government is entering the final phase of its term in office and the Obama administration could have put matters on hold until after the 2014 parliamentary poll, but by inviting Manmohan Singh, Washington signaled that the US-Indian relations are not vulnerable to political changes in India. Of course, Manmohan Singh has been more rooted than any previous Indian prime minister in his conviction that a robust strategic relationship with the US is in India’s long-term interests. 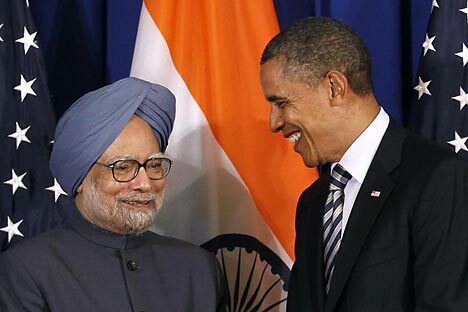 Obama’s invitation is an American salute to the Manmohan Singh era in Indian politics. Besides, the time is ripe to garner the results of the work in progress. Following his recent consultations in Washington preparing for Manmohan Singh’s visit, National Security Advisor Shivshankar Menon exuded the confidence that “very substantive” results could be expected from the visit. The Indian Prime Minister’s Office has been directly holding discussions with Pentagon officials on ushering in a qualitatively new level of partnership in defence co-production involving technology transfer. There are strong signals that a breakthrough is at hand. If that happens, a seamless vista of partnership will open up. Clearly, India’s capacity to create negotiating space vis-à-vis China is linked to the verve of the US-India strategic ties. Indeed, India needs to draw a “red line” whereby it doesn’t get drawn into the US’s containment project vis-à-vis China. On balance, given the probability that US-China rivalry will aggravate, advantage lies with India to build up parallel tracks of robust strategic partnership with the US and normalization with China. Beijing lapses into a patronizing mood if it transpires that the US-Indian strategic ties are languishing. The unfortunate part is that Manmohan Singh’s visit cannot be optimal. India has run to an acute situation on the economic front – freefalling rupee, fears over investment flight, drop in growth (5 percent) and a huge budget deficit. The falling currency and flight of investors arise largely out of factors outside India’s control and is linked to signals by the US Federal Reserve to end its buying of Treasury bonds, which is luring investors back to the US from emerging markets such as India, Brazil, South Africa, Indonesia and Turkey. All said, however, the Americans take a slightly longer-term view of India, which is certainly more optimistic. The fundamentals of India’s economy remain in place, foreign companies continue to come to India, appetite for spending among India’s new middle class still remains strong and in areas such as higher education or retail in which the US companies are greatly interested, opportunities are many. In sum, Obama’s invitation to Manmohan Singh is an acknowledgement that the US would view in perspective the potentials of India’s economy. There is a national consensus in India regarding the high importance of the US-India strategic partnership and if there are constraints in adding greater economic content to the relations, the reason for it is almost entirely to be attributed to the state of the Indian economy and the standstill in the reform program. This consensus in the domestic opinion, however, is completely lacking with regard to India’s relations with Pakistan and China. The transformation in the overall climate of Sino-Indian relations, which was a diplomatic achievement of 2012, began dissipating after the standoff in Ladakh in April. The Indian media is awash with reports of increased Chinese “incursions” in the disputed border region. The reports are uncorroborated, but they get played up in media commentaries and pundits step in to offer far-fetched speculations regarding China’s dubious intentions toward India’s rise. The government says as little as possible and the notoriously unreliable Indian media reports create mass scale misperceptions. In a glaring example last week Indian media reported that Chinese troops made a 30-kilometre “incursion” in Arunachal Pradesh and stayed put for four days before going back. Most certainly, it seemed a highly provocative act – except that it was baloney. Such clarifications but they are few and far between and interest groups have begun vitiating the climate of the Indian Prime Minister’s forthcoming visit to China during which it has been widely expected that a landmark agreement relating to the disputed border might be signed, which aims at reducing the scope of tensions. The big question, of course, is: Who stands to gain out of the foul air in the Himalayas? Put differently, who is afraid of peace and tranquillity on the disputed Sino-Indian border? A comparable situation has arisen also with regard to India-Pakistan relations, which threaten to mar the proposed meeting of the two prime ministers. The conditions seemed favourable up until very recently for a potentially purposive meeting between in New York between Manmohan Singh and Nawaz Sharif. The back channel diplomacy worked hard to prepare the ground and a full-bodied India-Pakistan dialogue was set to commence. True, India harbours deep misgivings about Sharif’s capacity to redeem his pledges of peace, friendship and cooperation, given the dominance of the military in the Pakistani power structure. Equally, Delhi is yet to see any concrete moves on Pakistan’s part to address India’s security concerns. However, Sharif enjoys a lot of goodwill in India and Delhi hopes to strengthen the hands of those within Pakistan who desire good relations so that the hardliners (on both sides) incrementally get marginalized. All this now may seem irrelevant following the eruption of violence on India-Pakistan border in Kashmir a fortnight ago, which spread swiftly – and is daily occurrence – with claims and counter-claims and allegations and counter-allegations. Within India, the rhetoric morphed into an accusation of “failure” on the part of the government to take a “firm” stand on Pakistan and of lacking “courage” and “determination” in its inability “to give a strict response” to Islamabad. Curiously, some former diplomats – who as a breed are trained to talk even with the worst enemies – also voiced support. Suffice to say, a mountain heap of pressure has built up on Manmohan Singh not to engage Sharif in any meaningful way, regardless of the latter’s manifest eagerness to move forward with India, which, objectively speaking, is a vital component of his policy agenda for Pakistan. Indian diplomacy has seldom been caught in a bind like this. The thoughtful attempt to put together an architecture of inter-related – and mutually reinforcing – synergies developing in India’s relations with the US, China and Pakistan is running aground even before it is given a fair attempt. This failure can cost India dearly, because the regional politics and the international environment is rapidly transforming and neither the region nor the world is going to stand still until the dust settles down within India and a maturity of thinking and grit to sideline the hardliners and interest groups becomes possible. The essence of diplomacy is always to engage. Even Cold War adversaries engaged and that’s how détente was born. The Indian strategic community is yet to comprehend that cardinal point. All that Indian diplomacy is seeking a reprieve of mere sixty days, which is not too much to ask for by a well-meaning supplicant.